If the Bolognese passion for food inspires you then go to Il Salotto di Penelope for a cooking lesson and learn how to make an authentic spag bol (which is never eaten with spaghetti in Bologna). The best bit is that after slogging away making hand-rolled pasta and gnocchi (as soft angel’s pillows) you get to sit down and eat it all. “Barbara and Valeria will teach you how to prepare the perfect pasta from scratch. At Il Salotto di Penelope you will learn how the Bolognese classics are made at home”. “Try your hand at rolling fresh pasta or cooking up a traditional ragu sauce at cookery school Il Salotto di Penelope”. Il Salotto di Penelope mentioned in one of the most important food-blogs of Spain: El Comidista. Here we were taught which pasta shapes should be served with which sauces (it’s spaghetti, of course, with a classic Bolognese) and then had a chance to make some of the dishes for ourselves. “They say the secret to make great pasta is to stretch out the dough, so you can ‘see San Luca through it’ “. Lametayel is the most important Israelian website of travels and tourism. This article is dedicated to Emilia Romagna and Bologna is mentioned as an art city, where you can enjoy a lot of nice food. 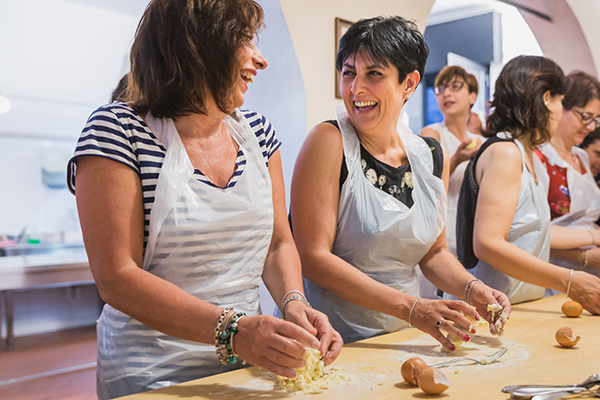 In this article Il Salotto di Penelope is mentioned as a good place to enjoy a class dedicated to families, where parents can learn how to prepare “pasta sfoglia” with their children. Mako is a popular news website. This article is dedicated to Emilia Romagna, easy to reach for Israelian tourists. Bologna, as always happens, is the main stop-over for all the art, food and beauty lovers.